Today is the day. Opening day. Every team is tied for first place. Every team controls its own destiny. This is the day of the clean slate, in which hope is alive for every player and every fan. Today the world changes. 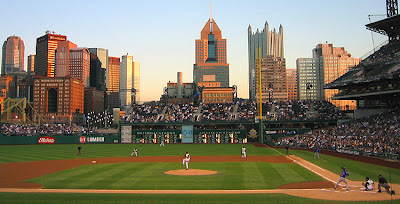 Tonight the Pittsburgh Pirates open the 2007 season in Houston against the Astros. Zach Duke will be on the hill for the Bucs, and he will be opposed by right-hander Roy Oswalt. There has been a countdown in the corner of this website for several months, counting down the days, hours and minutes leading up to that first pitch by Oswalt. We are no longer using days, as our destination is nearly here. The phrase "wait 'til next year" was first uttered in April 2006. It first officially appeared on this site in September. However, those words no longer have any meaning. This year is all that matters. The last time the Pirates were successful, I was eight years old. I turn 23 today. It is time for a change. That change begins right now.